The president of the historical society in Isleton, California has inherited a two-story wooden building with tin sides that she believes once housed a Chinese Tong. In the late 1800s, Chinese immigrants risked all to start a new life in America. But Americans who feared losing jobs to the new, cheap labor turned the land of opportunity hostile. Chinatowns burned, ethnic slurs flew and Congress prohibited Chinese laborers from entering or working in the country. For outcast Chinese, Tongs were places of protection and solidarity during this time of chaos, where they could worship, study and settle legal disputes peacefully. In the newspapers, the Tongs were secretive centers of gangland warfare, opium deals and gambling. Was there a Tong operating inside Isleton’s once-booming Chinatown? If so, what happened there? 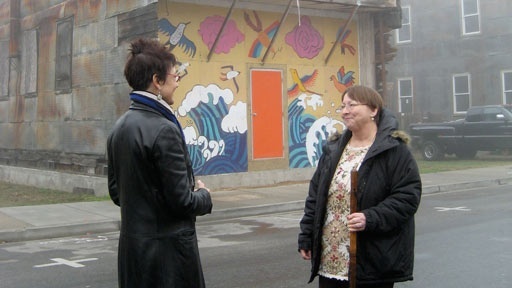 History Detectives examines a colorful building and the sometimes secretive societies of the Chinese immigrant past. Also in Emerging Modern America: 1890-1930 Great Mexican War Posters Is this an advertisement for a film made by an eyewitness to the Mexican Revolution? Also in Emerging Modern America: 1890-1930 Cromwell Dixon Plane Fragment What could this faded scrap of fabric tell us about the first pilot to conquer the Continental Divide? Also with Gwen Wright Thomas Edison's House Was this New Jersey home built by inventor Thomas Edison?